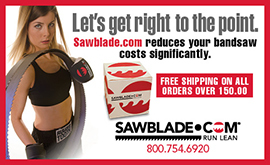 SawBlade.com is one of the fastest growing companies selling quality bandsaw blades. If you visit our website, there is detailed information about each blade and added info about usage and type. We offer various shipping options as well as ground and next-day shipping. Ordering bandsaw blades online is straightforward, hassle-free, and completely secure. Buying online is simple by just clicking on the links that provide details about blade size, TPI, blade type, thickness, and length. Bandsaw suppliers create websites to help build recognition and to use this as a marketing tool to attract customers. It is easy for customers to find the products they are looking for using our website to shop for bandsaw blades. We offer discount promotions, and purchasing bandsaw blades in a short amount of time is convenient. We offer affordable products without the marketing gimmicks, up-selling efforts, or the over-eager sales person trying to force unwanted merchandise on an unsuspecting customer. We provide a section on blade type, measurement, TPI, and thickness, making it easy and quick-order. The types of bandsaw blades listed are detailed with information. Companies that offer order to weld service means the product arrives at the manufacturer with custom specifications perfect for the machine and cutting application. We offer reviews about a certain blades and machines and their various parts. If there is an issue with a bandsaw blade ordered online, call customer service for further assistance. You are guaranteed prompt response and solutions from knowledgeable staff. If the order has issues that include things like wrong blade thickness, TPI , length, or simple dissatisfaction with the product purchased, our return policy is effective, but we usually prefer to ask a few questions in order to assure the same problem won’t occur in the future. Our goal is to sell quality products at reasonable prices in order to generate happy return customers, and if the consensus on a certain product proves negative, we need to know. Be sure to visit our website and look over the various types of saw blades offered. Hopefully, you will discover the ideal blade for the ideal cutting operation. This entry was posted in All Posts and tagged #bandsaws, #SawBlades, Bandsaw, machines, machinists, Online buying, saw blades, sawblade.com, woodworkers. Bookmark the permalink.